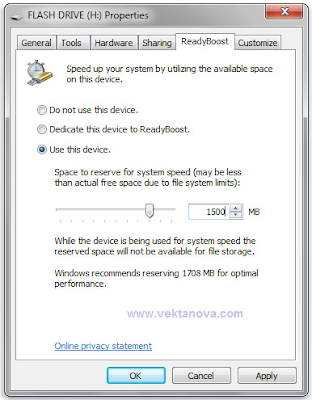 You can enable or disable ReadyBoost for a specific flash drive or other removable storage device. For more information, see how to Turn ReadyBoost on or off for a storage device on a section below here. Decide, choose and then click OK.
Move the slider to choose how much space you want to designate for boosting your system speed. For more, look at the picture. If AutoPlay doesn't open, it might be disabled. For ReadyBoost to effectively speed up your computer, the flash drive or memory card should have at least 1 gigabyte (GB) of available space. If your drive or card doesn't have enough available space for ReadyBoost, you'll see a message telling you to free some space on it. For best results, use a flash drive or flash memory card with at least double the amount of available space as the amount of memory (RAM) in your computer. What to look for in a flash memory device? No response yet to "Using Memory in Your Storage Device to Speed Up Your Windows Seven Computer"